The Bead Barrette. I've been seeing and reading the buzz about it, and was more than a Little Excited because they weren't yet sold in my area, But you can now find them at Walmart and my favorite go to Snapaholics when I don't carry a certain item, i'm sure they do. 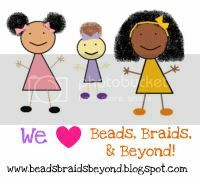 The Bead Barrette came to life, when owner and designer Jennifer Zachery, needed a solution to the common problem of Toddlers and Beads, when her daughter Kyndal's daycare banned beads ( in their center and thank heavens they did or we wouldn't have this awesome product) in their center. Which was easy enough, and we added some basketball beads because Tye asked, and i did not have to use rubber bands on his ends, bonus! I can truly saw I am more than happy with these snap on beads. It was quick easy and saved me lots of frustration, from having to bead and tread beads... I can just imagine all of the creative uses of for these, and the versatility of hair types and styles. 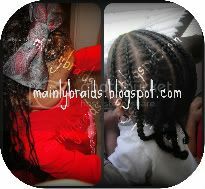 they can be used on ponytails, braids, twist, locs and so much more.